One of the few trouble spots for him was within the very important colony of Haiti. Colonies had been banned under the constitutions of the Revolution, but he was convinced that he needed to reconquer this colony and restart slavery there (that had been ended in 1794). He sent a force to reconquer Saint-Domingue which had been taken over by slave revolts since the end of it as a colony. The great Haitian generals L’Ouverture and Dessalines would destroy the French forces as well as Spanish and British forces, although some of these forces were killed from yellow fever. This loss would cause Napoleon to rethink his focus on this and other colonies that the French controlled. He quickly realized that he couldn’t defend his American lands while preparing to fight the British again and dealing with the economic issues in France. This decision caused him to sell his lands in North America to the United States in what is known as the Louisiana Purchase (for 3 cents per acre). the Bourbon monarchs, the Duke of Enghien. In what would become known as the Duke of Enghien Affair (1804), the British tried to place the Duke on the throne after a royalist attack on the French government. Napoleon would be tipped off by torturing a man in prison that the Duke, who émigré in Baden, was a part of the plot so Napoleon sent troops to have him arrested. The Duke would be put on trial for treason and it was discovered that he was paid £4,200 per year by England to battle France. He was found guilty and executed in a ditch outside the fortress of Vincennes in a poorly concealed attempt by Napoleon to get rid of the entire bloodline of the Bourbons. The rest of Europe believed he wasn’t involved in the plot and was horrified that the French had taken such a hardline stance. The fact that it was done after a secret trial only made it worse to the other countries. This external thread to the country united the people behind Napoleon in a way they hadn’t before. He would claim that the only way to keep the royalists from taking back over was to give the power to him, but he claimed that he would only take this right if it was given freely by the people (not through divine right). By stating his case that way, the people of France would believe that he was a reluctant leader, even though this was just part of his normal propaganda routine. 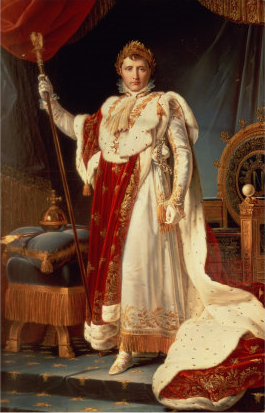 The senate would pass a bill that not only changed the government of France, but gave him the title of Emperor. The public vote to approve this would win with a 99.3% victory in another of his many fixed elections. He would become the first monarch of France to be called Emperor since Charles the Fat (881–887). Napoleon was crowned Napoleon I by Pope Pius VII at Notre Dame Cathedral (1804) in a ceremony that would cost over 8.5 million francs. He would blend Roman pageantry with concepts from the coronation of Charlemagne in an attempt to make this a spectacle with historic connections. He decided early on that the visual of being crowned by the Pope implied that the Pope was giving him the power, and thus more powerful than he was. So in the ceremony he would be given the crown by the Pope and would crown himself to bypass this issue. He would also be crowned as King of Italy with the Iron Crown of Lombardy at a later date (1805). The famous musician Beethoven had originally liked Napoleon enough to dedicate his third symphony to him, but after he became emperor Beethoven would rename it in disgust for what he had done.